I saw this article posted on my Facebook feed this morning and naturally it caught my eye. 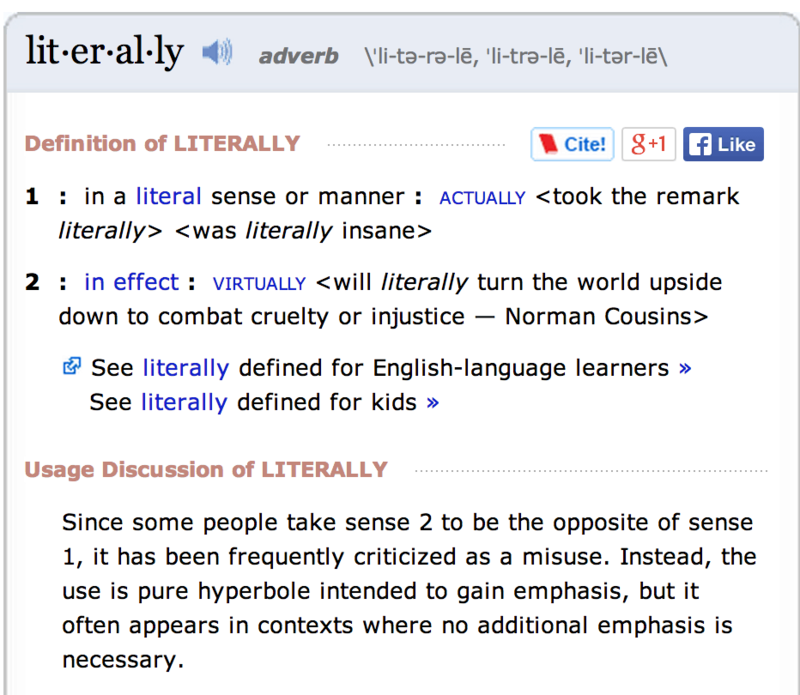 To sum it up, the Merriam Webster Dictionary has decided to include a new definition for the word “literally“. So basically, humans misused a word so much that the dictionary decided that the figurative interpretation of the word should be included in the definition. Next thing you know they’ll add selfie, catfish, tweep, and gamification. OH WAIT – THOSE WORDS HAVE ALREADY BEEN ADDED. Kill me!!!!! LITERALLY KILL ME. I feel like society is crumbling right before my eyes. And I know – in some small way – that this MUST have been what my mother felt while I was growing up in the 80s and 90s. It’s the only thing that keeps me sane. I’m not part of the only generation of parents that have felt lost and defeated and without hope. But somehow I feel like I am amongst those with the least amount hope left. It’s all gone to s***. I seriously believe that. 15 minutes of watching the news will show you what I mean. I can’t even watch the news or read the paper anymore because I get an overwhelming sense of disgust when I do. It makes me feel helpless and dirty and I start having crazy feelings of wanting to build a cabin off the grid like those families in ‘The Village’. But I’m a blogger and wouldn’t last 4 days without electricity. And I mean that as literally- literally. Not figuratively – literally. Maybe I’m part of the problem? Maybe I misused the word so much during my day-to-day life that the people at Merriam Webster Dictionary just gave up and hit the floor. I don’t know. This hole is too deep. I fear for my children. This represents so much more than just a simple silly word added to a very large book. This is like Miley Cyrus cats plastered all over the world times 10. That’s what this feels like. Miley wins. I can’t explain it. MTV wins. The Real Housewives of New Jersey win. The Kardashians win. And unfortunately, there’s not another race to enter. There’s only ONE in this game and we are all in it together. I enjoyed this post. Lately I can’t turn on the news or I will get sucked in for hours trying to see a light at the end of the tunnel, followed by a huge sense of guilt for the things that I do have and the sense of safety I feel that so many others don’t even in their own homes.